A real gem, so desolate looking and marvelously framed! Ceropegia wrote: A real gem, so desolate looking and marvelously framed! Thank you, Martha. I am glad you liked it and I appreciate your taking the time to comment. Week 24, an infrared panorama. 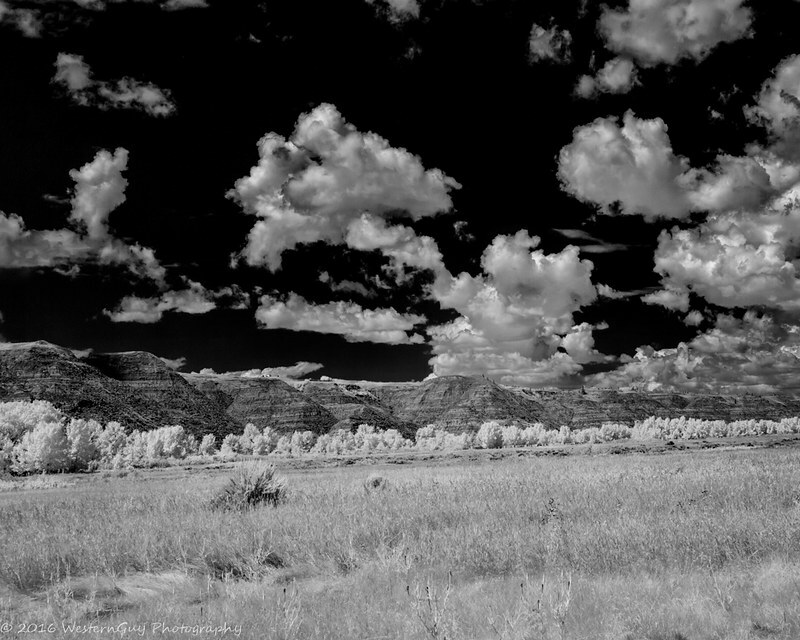 This image, actually three, was an experiment for me as it was something I had never tried before - an IR pano. My wife and I were out in the foothills, off-roading on some of the 4x4 trails and came upon a small open area with a 360 degree view of the surroundings, mostly the foothills, although you can see some of the tops of mountain peaks in the front ranges of the Rockies in a few places. This is a 3 image composite shot with my 590nm converted Canon 5D III and a 24-105mm lens. Processing was done in Lightroom (Develop and Merge) and Photoshop CC (Channel swap and "colour" adjustments). The clearings in the wooded areas are not a foothills golf course , rather they are the result of logging activity in the foothills. Neat shot WG. I really find your IR shots to be interesting and different. TomCofer wrote: Neat shot WG. I really find your IR shots to be interesting and different. Thanks St3v3M. I appreciate your looking. Week 25, "badlands" development along the Red Der River valley, central Alberta. This is a black and white conversion of a 590nm image taken with my converted 5D and a 24-105m L IS lens. Processing was done in Lightroom and Nik's Silver Efex Pro 2. The trees in the middle of the image mark the location of the Red Deer River and the valley walls show the first characteristics of typical Alberta "badlands" erosion. I will be gone for a couple of weeks on safari in Africa and will have very little, if any, access to the Web. I will catch up on my postings upon return. Thanks Tom. For me, that is what IR is all about - getting a different look.